The March issue of the Sir Walter St John’s School Magazine was a Special War Number. This stemmed from the boys in the school attempting to get in touch with all the old doys on active service so that they could send them a Christmas greeting and some cigarettes, resulting in a selection of the letters home in response being selected for publication. Your kind packet was forwarded me from Fort William, where we were stationed for 13 months. I cannot say how long we shall be at Lucknow, but expect before very long to go to the Gulf, where things are pretty lively. 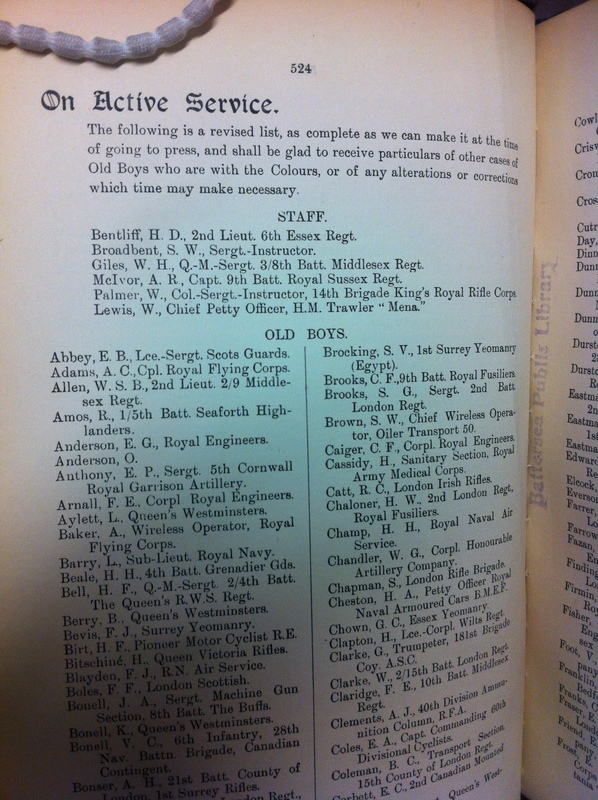 The magazine also contains as full a list as the school could manage of old boys and staff who were on active service. It lists their rank and regiment, and carries an update to the school’s Roll of Honour, listing 4 old boys killed and giving details of what happened to them as far as possible. 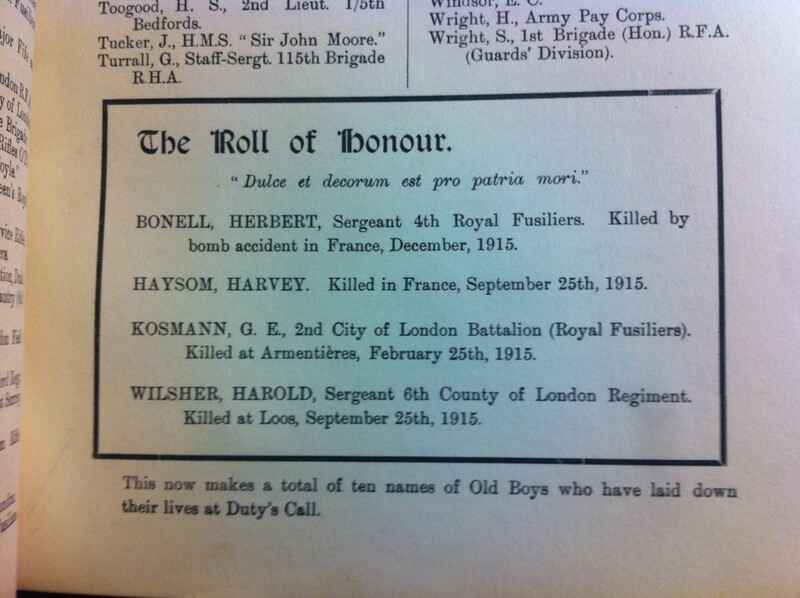 Harvey Haysom only has “killed in France”, whilst Herbert Bonnell, G E Kosmann and Harold Wilsher all have more detailed accounts. Elsewhere in the magazine, news of everyday school life continued. Meetings of the Debating Society were reported, as were football, fives and cricket scores. The Speech Day prize list was published, as were the names of the four best boys in each form following the Christmas exams. The Christmas collection subscription list and where the funds went was listed, as well as the cigarette purchase, money was donated to Queen Mary’s Hospital or Soldiers and Sailors who have lost limbs and the Wandsworth Schools Motor Ambulance, in addition to other local, non-war-related causes. After the controversy over the No Conscription Fellowship having their hall booking cancelled a couple of weeks ago, and the introduction of the Military Service Act on 27 January, it might be expected that the Tribunal meetings this week would be particularly keen to disallow claims. Conscription did not actually start until March, so all those coming before the Tribunal were still coming through the Derby Scheme. Neither the meeting of 22nd January or that of the 24th granted full exemption to any of the applicants. The write up of the Tribunal in the South Western Star does not supply the names of the majority of claimants, but it gives enough information that the details in the minutes can be matched up and a fuller picture can be put together of the men before the Tribunal. Cases before the Tribunal included that of Arthur Bridge, a Battersea alderman, who was applying on behalf of his son, Arthur Stanley (known as Stanley). Bridge was a coal merchant who supplied Morgan Crucible’s Battersea works – which were engaged on munitions work. He said that they were so short-staffed that they did not have enough men for their craft, his son had been apprenticed and was able to be second hand on a barge or tug. In the 1911 census Stanley is listed as clerk at the coal merchants, so had obviously had to do extra duties due to the war, the Tribunal minutes list him as a “manager” and his solicitor claims that he manages the transport. His claim was disallowed and went to the appeal, reported back on at the Tribunal of 18th March. The appeal only gained him three months, presumably as this was considered enough time for someone else to be trained in the work. Several of the cases before the Tribunal were ones in which employing women instead was suggested. Dr Pearson of Bolingbroke Grove applied for exemption for his chauffeur, John Hayler, as he needed him for business and his “wife objects to a lady”. The newspaper reports that the Tribunal were unsympathetic to this claim and laughed at the objection, saying that the country needed his man – the claim was disallowed. John Hayler’s military service record survives, showing that he was married and had three children, which should have allowed him to go into a later Group. A man seeking exemption for his son, who was a driver, said that “women are not a success as drivers of motor cars”, which was not queried by the Tribunal, instead they pointed out that his son had papers stating him to be medically unfit and therefore the matter was already taken care of. The Tribunal also suggested that A I Biscuits should hire women in the factory when they refused exemptions for a mixer and a brakesman – although the firm’s owner, Mr Dunmore, argued that women were not able to do the work as it involved bags of flour weighing two cwt. Price’s Candle Factory argued that their export ledger keeper could be replaced by a woman but it would take two years to train and that there was no-one else suitable for the role, the firm was carrying out important contracts for the Government but the application for exemption was disallowed. February’s edition of the Gazette of the 3rd London General Hospital contains an image by Private C R W Nevinson of “A Futurist’s Impression: The Receiving Hall”. 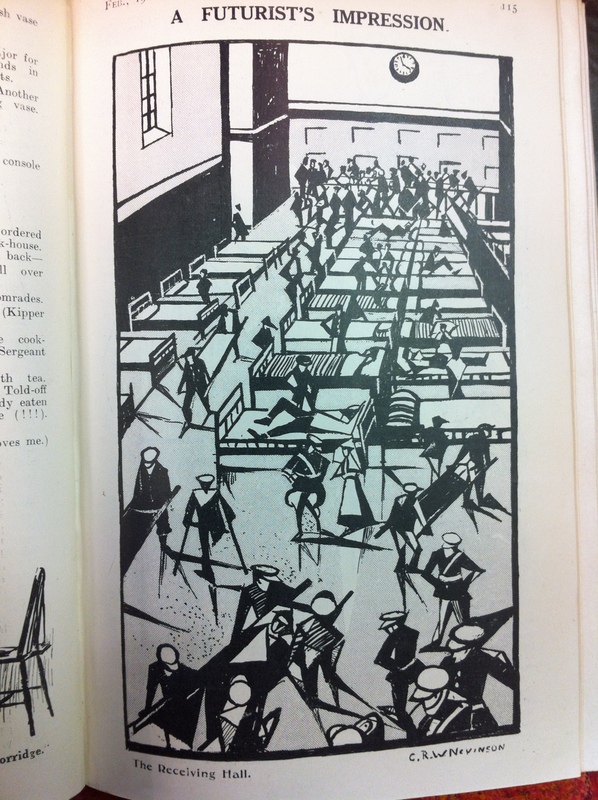 This was the last image drawn by Nevinson whilst he was on the staff at the hospital, the notes column on contributors says that he was discharged from service due to ill-health – although he did still contribute to later editions. The receiving ward, and process of receiving new patients, was also covered by a series of cartoons from new contributor Captain C Rhodes Harrison, with a rather less serious approach. Arrival of patients to the hospital has been briefly covered in the blog before (see here), mainly referring to the reception granted to patients arriving at the station. There are various suggestions that a special platform was built for the hospital – so far this has not been mentioned in the Gazette and it does not appear on the 1916 Ordnance Survey map. An account of the arrival of the first patients in the January Gazette says that the staff all watched for the Red Cross train coming up the line past the hospital and that they waved and cheered as it went by, then promptly all scattered to be on the wards ready for the patients coming from Clapham Junction. A later description of an intake of wounded describes the orderlies waiting outside the hospital for the ambulance convoy to arrive: “They chat and joke in subdued voices. Some puff the surreptitious smoke. Suddenly there is a stir. Someone has caught sight of the lamps of the first ambulance, creeping at a snail’s pace along the road on the far side of the railway line”. As the ambulances reached the entrance, the main doors were opened and Matron and the sergeants came out to oversee the arrivals. Four orderlies went to each ambulance to take the stretchers – sometimes as many as four in each ambulance – and carry them into the receiving hall. On the way in they were stopped by doctors who checked what was wrong with each patient and assigned them to the appropriate ward, whilst other orderlies brought in bundles of uniform and patients’ possessions, which were all recorded before taken to stores. The Rhodes-Harrison cartoon implies the efficiency of the process, if not entirely accurately. Elsewhere in the February Gazette, the Notices, a regular feature on the back page, included several directed towards ANZAC troops. Cabling to Australia was advertised as available at a special rate, available from the Australian War Contingent Association, which also advertised opportunities for Australians on furlough to spend some of their time in country houses in England. The New Zealand War Contingent Association had a memorandum on display in the Recreation Room, with information on cabling, correspondence and accommodation in London. Both sets of troops were to be made welcome at 130 Horseferry Road, where an “energetic staff of Australian ladies” had set up the ANZAC buffet. ANZAC troops featured elsewhere in the Gazette on a regular basis, this month also includes two sketches by Vernon Lorimer of the 5th Field Ambulance AIF, as well as his illustrations for a piece called “Jonah’s Diary”. The Battersea Council meeting of 9th February 1916 contains the information that the Battersea Trades and Labour Council made representations to protest that their meeting in Latchmere Baths was cancelled by the Baths Committee. No explanation is given in the minutes as to why the meeting was cancelled – the report submitted to the meeting by the Baths and Wash-houses Committee refers only to their spending and not to any decisions they might have made. The South Western Star, reporting on the Council meeting, had a rather fuller version of events – as is often the case – referring to it as a “noisy demand for ‘free speech’”, which took up two hours of the meeting. An unusually large number of persons, several being women, were in the gallery. Mr Grundy, leaning over the rail, was prominent. The explanation of this is that an unpatriotic movement was suspected. The meeting had been to consider action to repeal the Military Service Bill, passed on 27th January, which brought in conscription. It appeared that the hall had been hired by the Battersea Trades and Labour Council, but was in fact hired by the local branch of the No Conscription Fellowship, according to the paper. The letter from the Trades and Labour Council stated that they had “decided to enter an emphatic protest at such action in attempting to stifle free criticism of the measure” – hence their deputation and the rather more lively meeting described by the Star. The fact that the hall had been hired by the No Conscription Fellowship lead to accusations of duplicity, as the Trades and Labour Council did not have a direct interest in the matter. The leader of the deputation, Mr Carmichael, claimed to be astounded that the cancellation had taken place in Battersea, a borough noted for its free speech, especially during the Boer War – there was an active Stop the War Committee during the Boer War – and with an MP who had done six weeks in prison for free speech thirty years ago. Comments on “where John Burns was now” came from the gallery, as his opposition to the war was well known, although Mr Carmichael pointed out that Burns had voted against the Military Service Bill. He also pointed out that Trade Unions had assisted with recruitment because they thought it would keep away conscription and that the Trade and Labour Council had held a practically unanimous vote to affirm their own opposition to conscription. The clerk who booked the hall had been under the impression that it was for a Trade and Labour Council meeting, and when the Committee realised that it was not they had held long discussions over what to do. A small majority had concluded that the best decision was to cancel the meeting, a decision upheld by their chair, Mr Simmonds, who thought that “in the present circumstances…the committee were justified”. Mr Bigden argued that it was “most monstrous that the Council should allow the use of the hall” for a No Conscription meeting, and other members argued that the Council should not be the arbiter of patriotism in the borough. This was followed by Mr Brogan launching what the Star called “a tremendous onslaught on rebels and labour, and unpatriotism”, an accusation which caused Carmichael to shout that he was a liar, resulting in him being removed from the chamber whilst Mr Brogan continued that “conscription has come, partly as a result of their apathy in regard to recruiting…Now they had conscription he felt it was his duty to loyally accept it”. The paper records insults to the No Conscription Fellowship and arguments about past bad behaviour at meetings and if that would be comparable to holding a No Conscription meeting, before eventually the Council decided not to refer the matter back to Committee and to carry on with the rest of the business of the day. Very little of the debate is reflected in the minutes, even though it took up two hours of the Council meeting and showed that the matter of conscription was a controversial one. Many members of the No Conscription Fellowship ended up before the Military Service Tribunals, including Clifford Allen, who write extensively for Fellowship’s news-sheet, The Tribunal, which we will be coming back to in future posts. In October 1915, a circular letter went to local authorities on the subject of Voluntary Organisations which resulted in the formation of county, city and borough Voluntary War Workers Associations. The minutes of the Wandsworth Association refer to a scheme for “co-ordinating and regulating voluntary work organisations throughout the United Kingdom”, with a Director General of Voluntary Organisations who would officially recognise groups who were working for Soldiers and Sailors requirements. The Director General’s main role was to organise donations gathered for troops and military hospitals, this article contains more information on charities during the war. Both Battersea and Wandsworth formed Associations, with the first meeting of the Battersea one on 31st January. Wandsworth’s first meeting was in December 1915 and by this week they had got beyond the initial set up and decisions on committee members and had responses from local charity groups to the Voluntary Organisations scheme. Most of these charities do not have surviving records themselves, some of the groups are mentioned in the local papers but the Association minutes show all the different groups at work in the borough. The minutes for this week also show how much work has been done so far by the groups who had responded – although presumably there were others at work who had not yet done so. The Clapham Women’s Liberal Association had been working since August 1914 and had dispatched 1000 articles to Queen Mary’s Guild and a further 400 to Lady Smith Dorrien. The Putney and Roehampton habitation of the Primrose League had three working parties and sent all completed work up to Primrose League headquarters. Several of the local churches had working parties, including St Mary Magdalene Wandsworth Common, St Margaret’s Streatham, St Stephens and the Church of the Holy Spirit, as well as there being a Parochial war work party in Clapham. Many of the church based groups were doing work for the Red Cross and Hospitals – the Clapham group had a depot at 43 The Chase, which worked in connection with the Red Cross working part of the Church of the Holy Spirit. Other depots were to be found in Streatham and Battersea, St Mary Magdalene, which parish was in both Wandsworth and Battersea boroughs, had a number of ladies who were working with those depots as well as having 4 working parties making items required for the 3rd London General Hospital. St Margaret’s Church was working with the Red Cross and the St John’s Ambulance Society. Not all the working parties in Wandsworth supplied information about their activities, the Magdalen Hospital Working Party in Streatham was registered with the Central Workrooms of the Red Cross and St Stephen’s Church working party was listed without any further details. The Association decided that the Director General of Voluntary Organisations should be approached to find what was required at present and then the local organisations were to be asked if they could provide the same, as well as how much they could produce in the next four weeks. Battersea’s meeting on 31st January had looked at the local depots, presumably with a view to organising them further. The hall at St Luke’s church was to be known as the Broomwood Ward Depot, St Luke’s Hall” and recognised as the only depot in the ward, and investigations were to be made to see if the Stormont Hall depot could be officially recognised as the only depot in the Bolingbroke Ward. The finance committee recorded that £34 8s 4d had been paid out to the Mayoress which had been used to purchase wool and needles to make mittens for the Battersea Battalion.